In my case, I’ve been gone a long time. Salisbury is a beautiful and pleasant place (we grew up in a village eight miles away) but I couldn’t wait to leave for a big city. 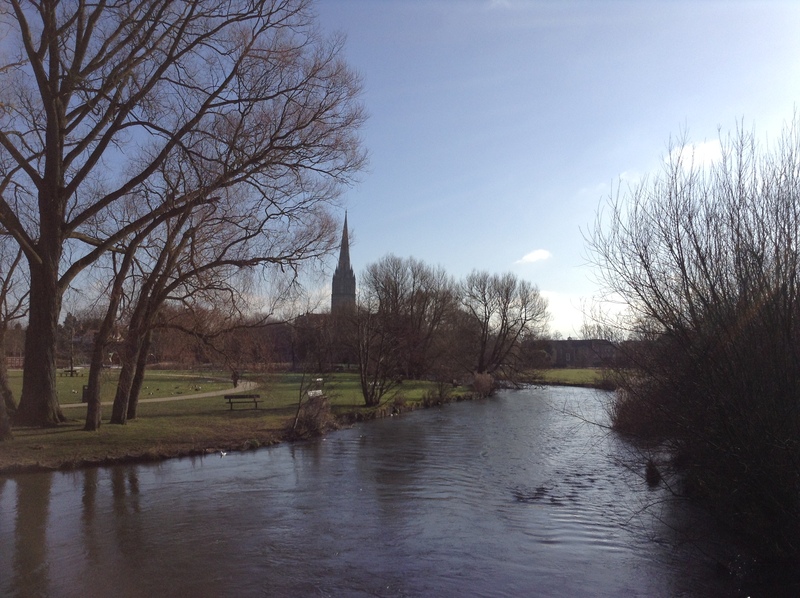 My recent stay was the longest since I left at the age of eighteen – unbelievably this week Salisbury Cathedral was free of scaffolding for the first time since the year after I went to college! I often feel that I’m not the same person as the girl who grew up here. Now I’m not so sure. I wandered around the city alone in freezing temperatures, assailed by thoughts and memories, some of them funny, most of them frankly pretty bleak. I saw boys from the grammar school in uniform and remembered when the one I liked finally noticed me and turned out to be the most repulsive kisser. I thought of long walks across the fields with our family dog Benny, who was constantly going missing and turning up thirty miles away. It is obviously terrible to watch someone close to you suffer and be powerless to stop it – the situation reminded me of my many trips home in 1991, the year my dad was dying of cancer. His exit was savage and far too early, but all I had to do was be sad and I realise now what a luxury that was. Now the three of us are in the strange position of being children again at the precise moment we need to be at our most adult, responsible not only for those we have brought into the world but for the person who did us that immeasurable favour. With the challenges of parenthood, you can usually tell yourself things will improve; with this the only consolation will be to know that when presented with hard decisions, we made the one we all thought was right. We’ve done all we can to make mum safe and comfortable. Strangely, a character in the novel I’ve just finished writing says (in a completely different context), ‘Stop worrying about yesterdays and tomorrows (…) there is only now.’ I’m going to try harder to remember that. Warmest wishes to you and your family. This is something we all go through; our family went through something similar with my wonderful mother-in-law last year — very hard, very important. Beautiful post. Sorry to hear this Isabel . Thinking of you . Your mother is lucky to have such wonderful children. It’s very hard….good luck with everything. I was very sad to read this — and it’s a situation many people will be able to identify and sympathise with. Just wanted to thank you for sharing something so difficult and wish you very well for the future. It’s a lot to deal with, not just the situation with your mother, but all the associations to your hometown. Just adding my sympathies to the list. Such a touching post Isabel. Going back to anywhere that was once familiar is such a strange experience. It feels familiar and yet you also feel a stranger. So much more difficult to do it in the circumstances you described.